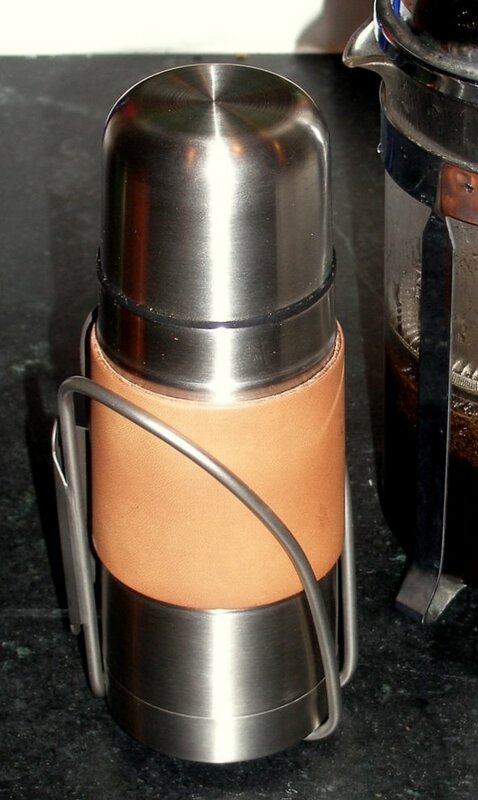 We have our first shipment of leather covered thermoses. 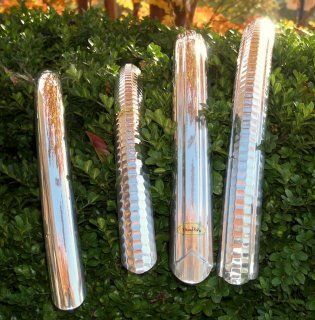 These are the ones that fit in a water bottle cage. It's getting cold and this is just the thing to keep you warm on those long winter rides. 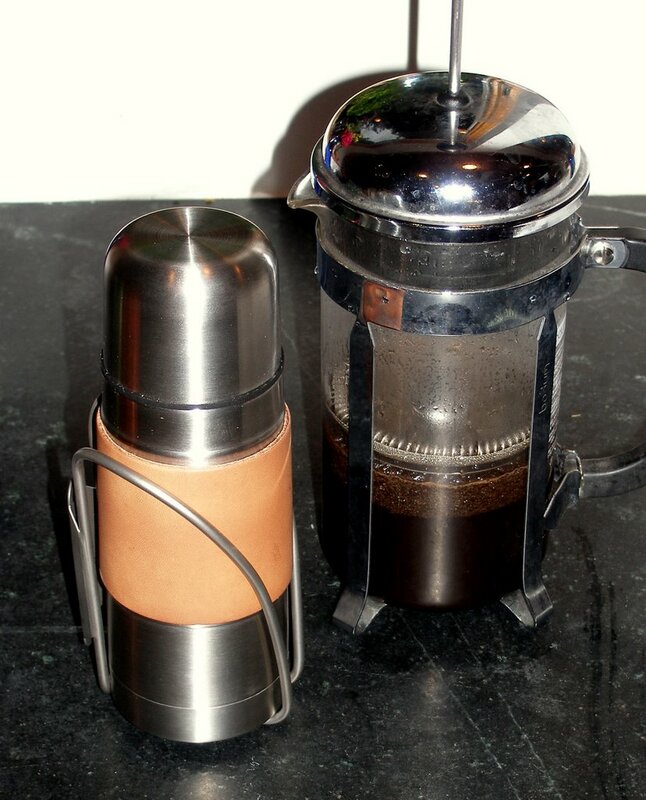 Fill it with coffee, tea, calvados, whatever. We'll probably run out of these, but we can get more in about two weeks. We also now have derailleur and brake cable housing in red, yellow, silver, dark green, blue, and stainless mesh. 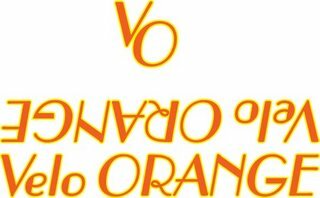 The orange we ordered turned out to be electric pink; I'll try again. A few days ago I learned, through a private e-mail, that Hagiwara-san is closing the ALPS frame shop. I see that the announcement has now been made public on his web site. 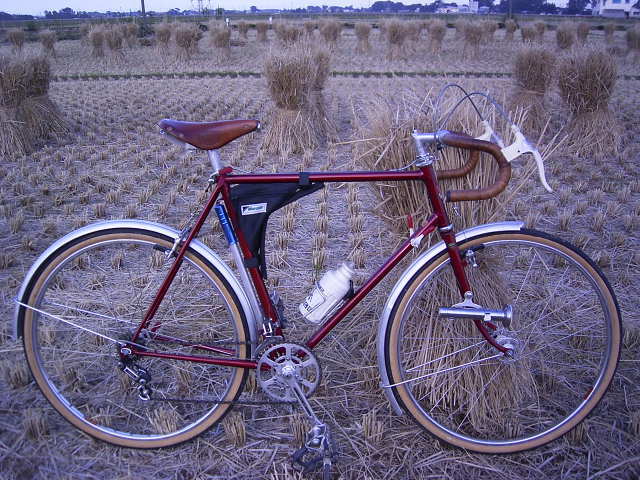 As you may know, ALPS has long been one of the finest constructeurs in Japan, and in the world. Hagiwara-san stopped taking orders from outside Japan some years ago. He wanted his bikes ridden, not admired. 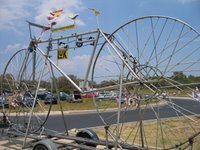 I think the photos of the bikes have been removed from the web site. I'll try to find a link to some additional photos later. If you have some please post them in comments. 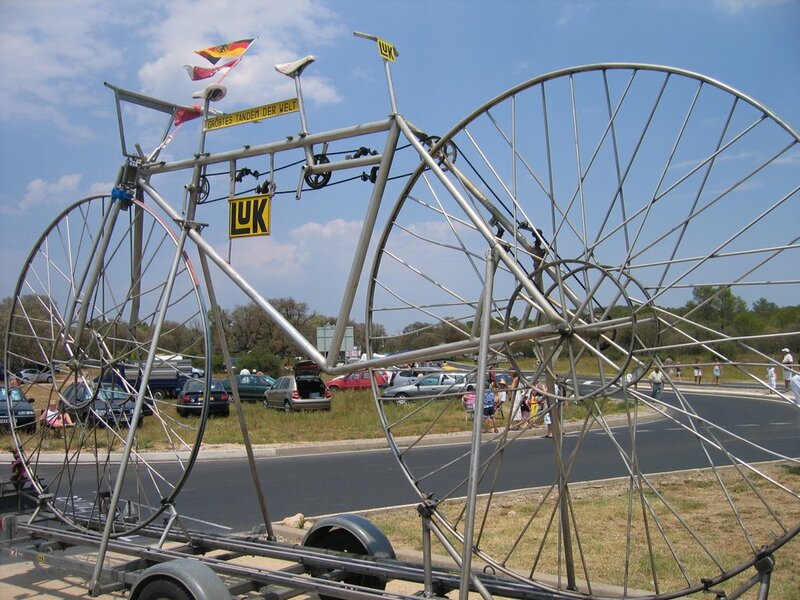 The photo is from the Classic Bicycles site, where there are lots of other special bikes to be seen. Interestingly, the very last ALPS frame to be built is going to one of our friends and customers. We found some new-old-stock rear derailleurs. The Simplex SX610 is the little brother to the famous Simplex SLJ5500 and SLJ 6600 that many experts think are among the best friction derailleurs ever made. Michael Barry of Mariposa fame, and perhaps the world's foremost derailleur expert, said that if equipping a bike for a 5 year world tour, he would use an SLJ5500 rear derailleur. 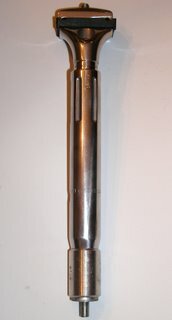 The fasteners and the parallelogram arms are steel on the SX610, rather than alloy as on the LJS5500 and SLJ6600. But some say that just makes them stiffer. The SX610 also has the more advanced drop parallelogram geometry that was clearly superior to the "straight" geometry on the SLJ5500, yet for some reason was never actively promoted by Simplex. Perhaps proud old Simplex didn't want to tout an advance copied from the Japanese. The SX610 will handle 28 tooth cogs. Use with a 7 or 8 speed chain for the ultimate performance. Add a Simplex 102 or a Simplex SLJ523 front derailleur, and you'll have about as nice a friction derailleur system as has ever been made. Thw SX610 uses the old Simplex style mount. 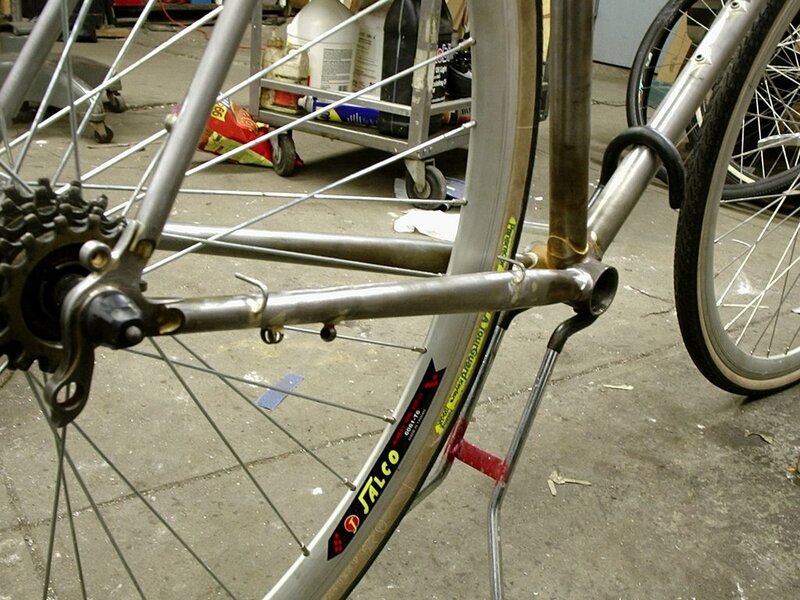 That means it fits modern dropouts, but uses a bolt that goes through the back of the hanger. It's not a big deal, but confusing if you've never seen one. We also have a few Huret Rival derailleurs. This is a very well designed late model classic derailleur. It handles 30t cogs and shifts beautifully. In fact, old magazine tests rated the shifting as "excellent". It is also a well built and rugged unit. Front and rear Rival derailleurs would make a great, and reasonably priced, system for a randonneur or cyclo-touring bike. UPDATE: We just found a small quantity of NOS Simplex Retrofriction levers. These are the very pretty type that Simplex made for Gipiemmi. Johnny sent a few photos of the rando frame. 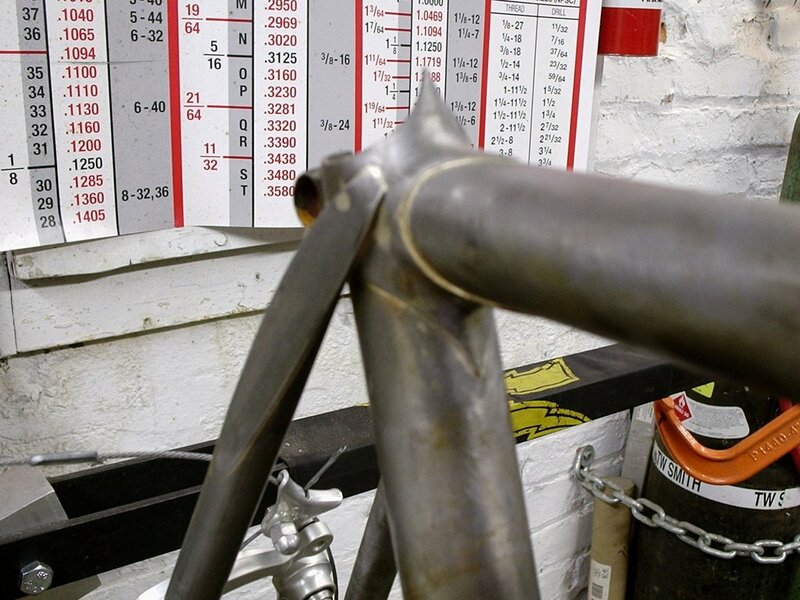 The white piece of paper taped to the down tube shows where the single decal will go on this frame. That's right, on top of the tube as the old constructeurs used to do. But two decals in the modern style are optional. Also, note the lovely curve in the fork blades. Johnny had to get a special mandrel to get that classic French look. I'm sorry that the photo of the seat stay caps isn't sharper; Johnny does those so well. The details on that rear Paragon dropout are also worth studying; that's art. We've switched to Henry James lugs as they better match our frame angles. The fork crown is by Richard Sachs, the Richie-issimo. 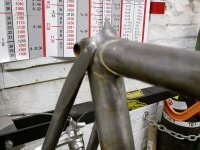 You may choose between a standard and oversize downtube. There will be eyelets for running generator wires on the inside of the right fork blade. Brazed-on centerpulls are still the standard brakes, but cantis or sidepulls are optional. 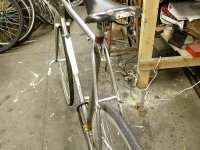 The first is a fillet brazed city bike frame based on an old Rene Herse design. 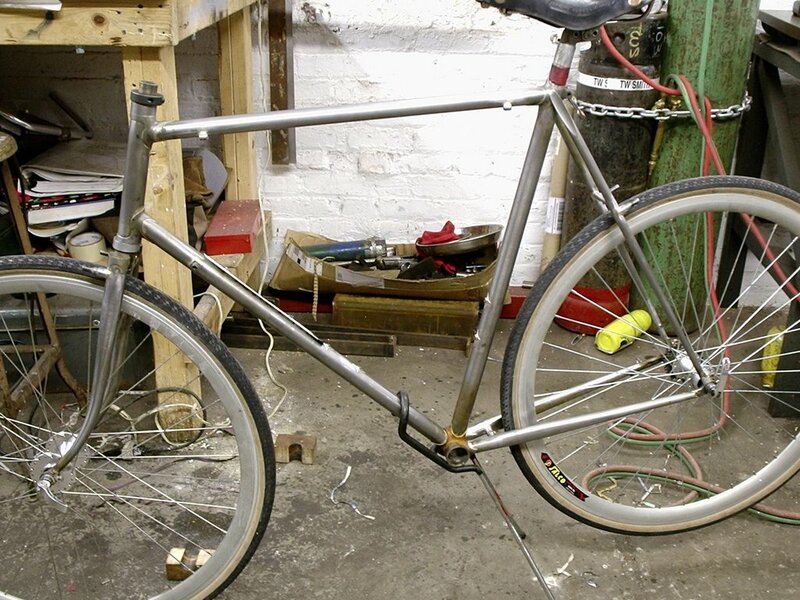 It can be speced with either derailleurs or internal gearing and will use 650B wheels. We'll have the prototype soon. This frame will be less expensive and may be powder coated, rather than painted. 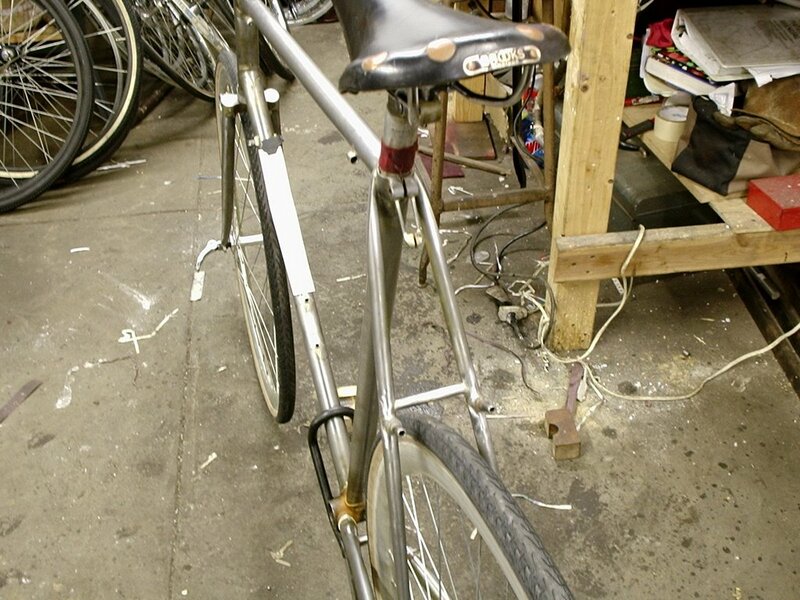 We also hope to have a mixte version. 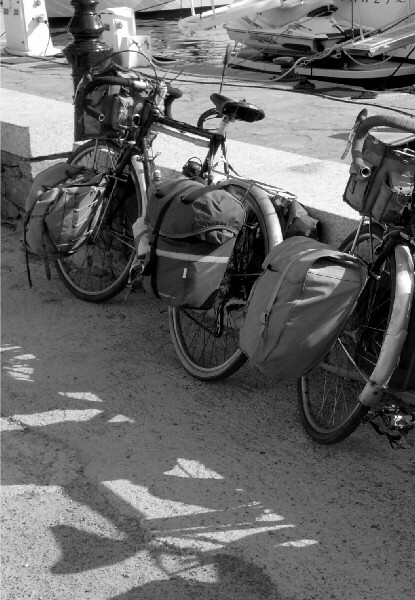 We will offer a version of the current Randonneur frame, to be called the Cyclo-Tourist with 650b wheels in all sizes. We are also designing a 650b "camping" or touring frame with braze-ons for full front and rear racks. 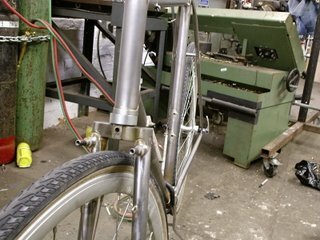 And finally, I am considering offering a premium version of our rando bike built up with classic new old stock components, Simplex deraileurs, TA crank, Mafac brakes, etc. The frame decals on the upper left are by Chuck Schmidt of Velo Retro. Lets have a moment of silence for the famous Stronglight Delta headset. I was informed today that they have gone out of production. We bought the last five at the factory. In other Stronglight news, we've ordered more Impact cranksets and will again have the 165mm size. Since the 165s sold out in days last time, you might want to reserve one. We're working on a brake section and have our first few products. The brake that everyone is talking about is the Tektro R556. 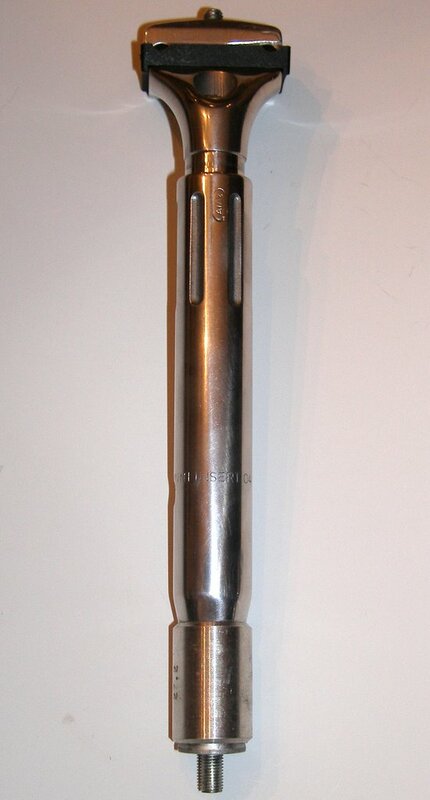 This is the first really high quality extra long reach sidepull brake; their reach is 55-73mm. 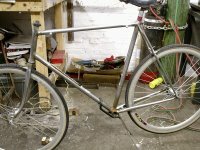 It's perfect for those who like to run big tires, and also for converting 700c frames for 650b wheels. 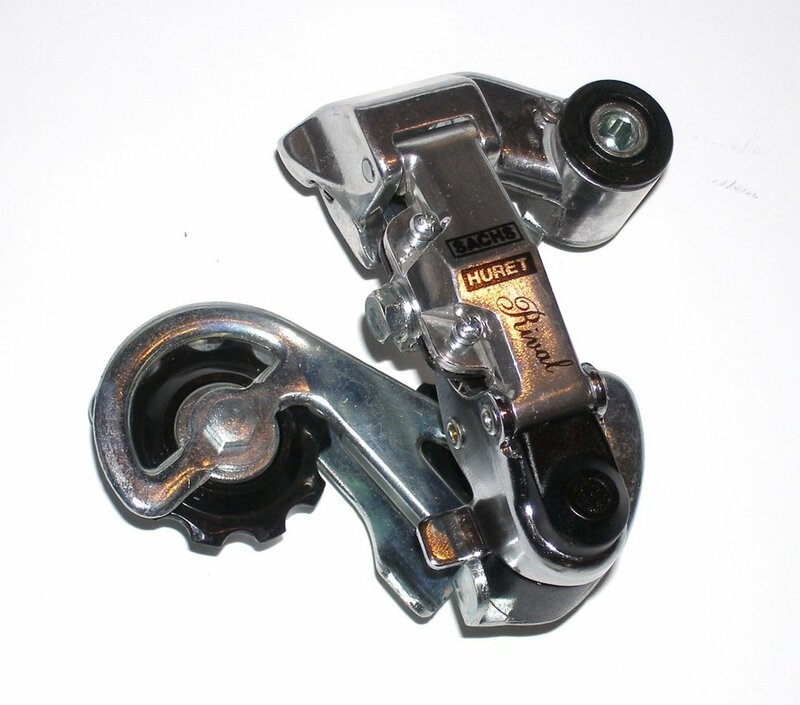 While they won't have the stopping power or modulation of top quality centerpulls or cantis, these are really well made brakes with a nice quick release and the extra power of dual pivots. At $59 per pair the price is great for a unique and high quality set of brakes. 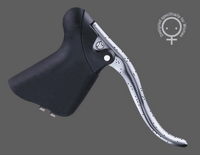 Campagnolo has never made great brakes, but they make the very best, and most expensive, brake levers. 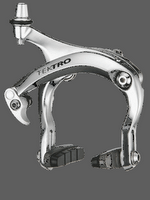 So Tektro copied Campy's design to produce the high quality yet affordable R100A and R200A aero brake levers. They even have the push button quick release which is the best ever devised. The R200 are for people with smaller hands and the R100 are for those with larger. I find these have the most comfortable brake hoods; they are wide and really fit my hands. 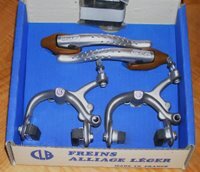 We also have some French CLB sidepull brake sets. these have a reach of 46-60mm. 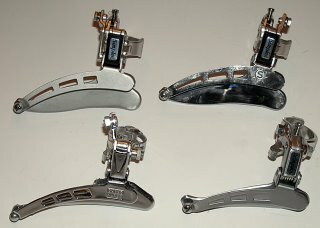 They include the calipers for nutted mounting, classic style drilled non-aero levers, grey cables, and an extra set of pads. The finish is a sort of metallic grey. They are $78 per set. You may know that I'm a big fan of center pull brakes. There is a post about them here. 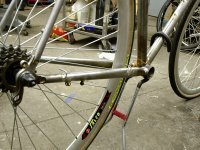 So we'll soon have Paul Racers as well as Paul Touring and Neo-Retro cantilever brakes, but that's another post. We'll also have Kool Stop pads. 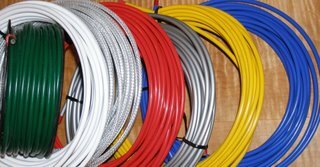 Another thing I've always wanted is modern brake and derailleur cable in an assortment of colors, blue, red, green, yellow, metallic silver. Anyone else think that would be cool for dressing up bikes? I think we've found a source. I'll get this stuff into the store in the next day or two. Are there any other brake related items you'd like to see us stock? 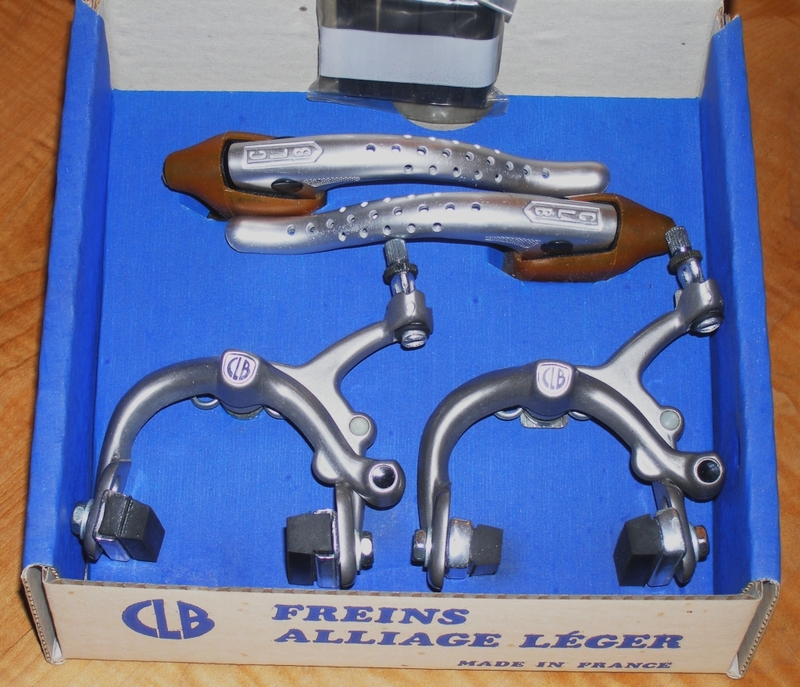 So We found some of the best classic front derailleurs. The Simplex Super LJ 503 front derailleur, upper left, is made for triples and is simply one of the best and prettiest derailleurs ever made. The cage has a lovely brushed finish and it's very light. We only have a few of these and they will not be cheap. 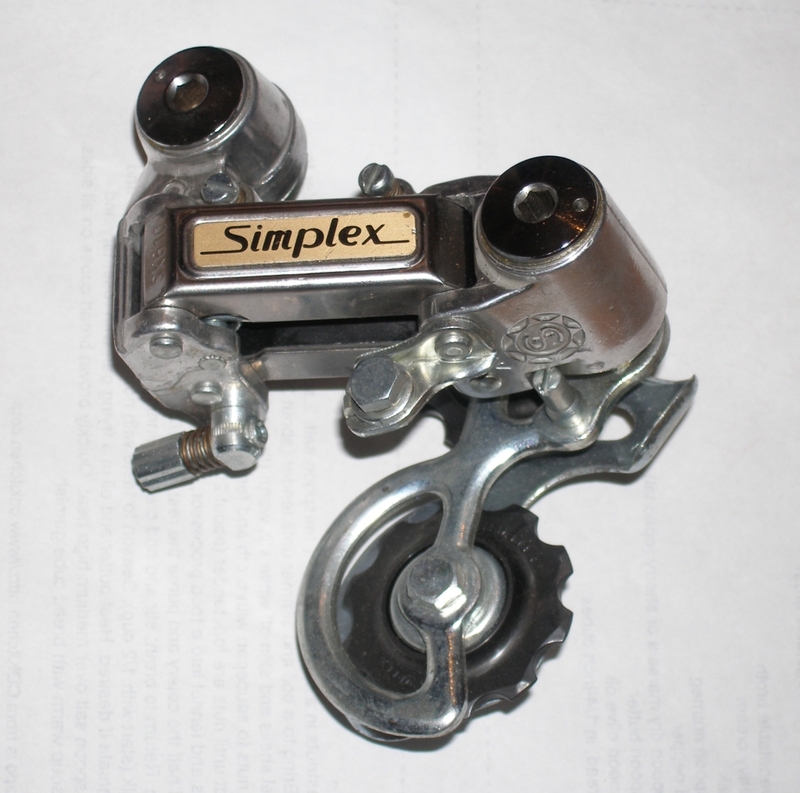 The Simplex on the upper right is the Super LJ 523 which is almost the same derailleur, but with a shiny chrome cage and the cable attachment on the front. The Simplex derailleurs have narrow cages, this means you may need to trim the front more often, but it helps them shift like butter. This is also a handsome derailleur. I should have wiped the oil off the cage before taking the photo; these were actually packed in oil-paper. On the lower left is the Huret-Sachs Rival for double chainrings. It's not quite as nicely finished as the Simplexes, but shifts just as well. Unlike some of the early Huret front changers, the Rivals were improved to be more rigid and less fragile. Finally the Simplex 102 for doubles is less expensive and a touch heavier, but still a rugged and fine shifting mechanism that will last for decades. It is also a very good looking derailleur. I think this is the best value of the bunch. Notice that the triple derailleurs have deeper, or lower, back cages. This helps them upshift from small granny rings. But they are fine for doubles too. In fact many people even use double derailleurs with triples. All of these derailleurs will shift with Campy Ergo levers and some Shimano systems. I'll have them in the store in a few days. 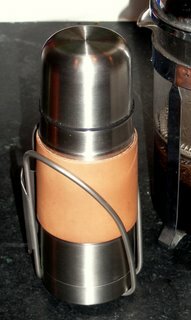 My wife has been bugging me to get her a thermos that fits into a water bottle cage. 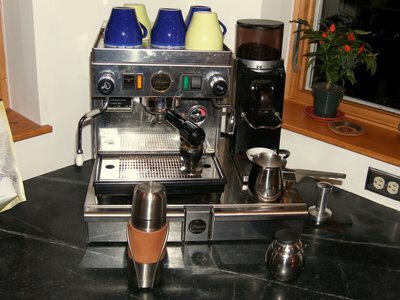 Actually I've wanted one too; we're both coffee addicts. 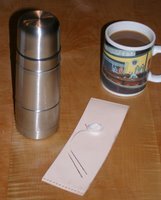 Anyway, I found this little kit to make a leather covered stainless steel thermos bottle that fits perfectly into a water bottle cage. All there is to it is sewing on the leather strip and putting some leather conditioner on it. 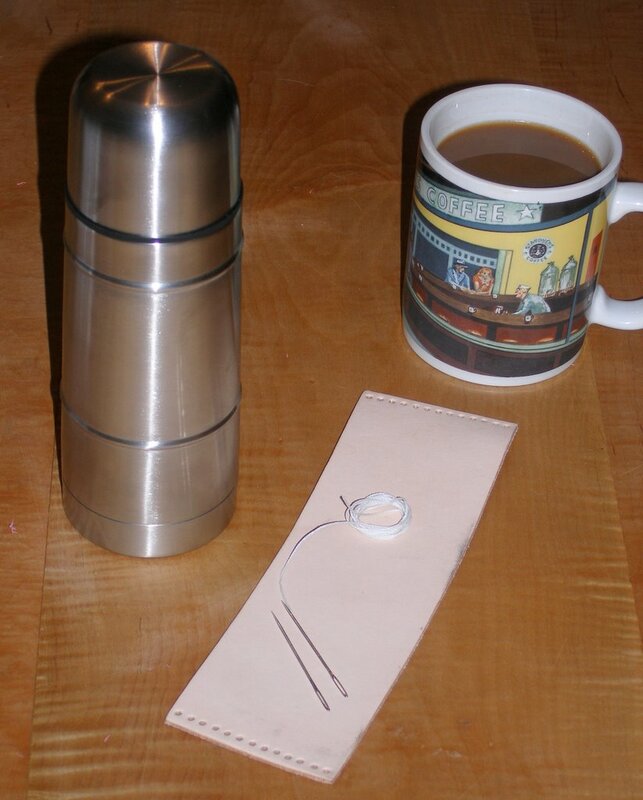 You could also tool a design on the leather if you have an artistic bent. I just put neatsfoot oil on this one and it turned a nice light honey color. I'll try some shoe polish on the next one to make it brown. 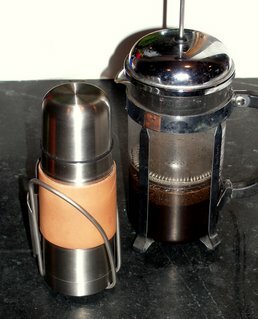 The bottle holds 12oz and has a handy push button top and a lid that serves as a cup. We could sell these for about $20-$25. Should we? 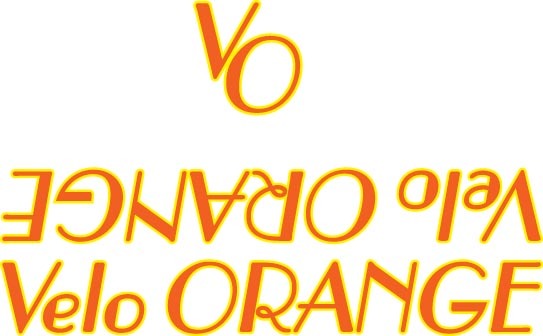 Would anyone buy one? This has me thinking, macrame messenger bags, make your own leather saddle kits, assemble a derailleur kits, the possibilities are endless. UPDATE: We'll have these next Friday and the cost will be $19.75. Let me know ifyou want one just to help me figure out if I've ordered enough. Right now we have some in 27.2mm and will get a few in 26mm. The price is $50. UPDATE: These are sold out and, so far as we know, are no longer available anywhere in any size. 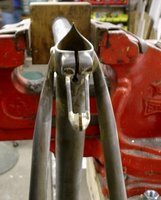 There is a certain joy to shifting the old way, reaching down and gently nudging a lever on the down tube. 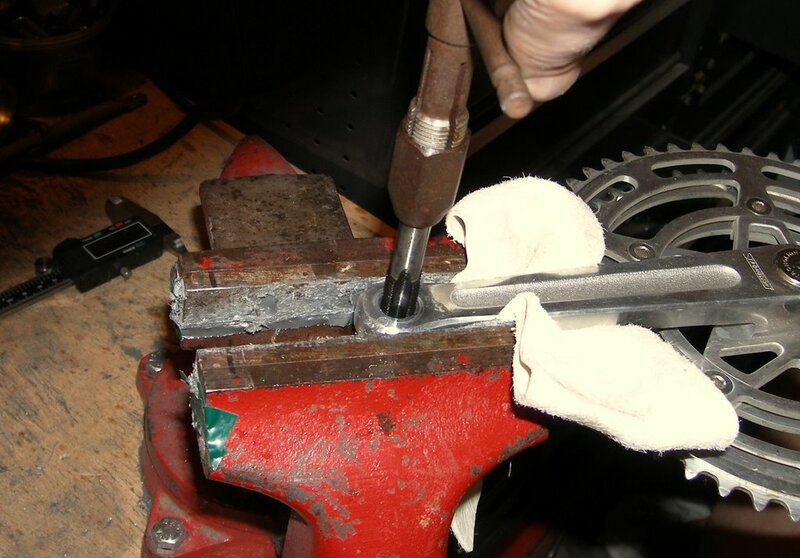 If you are practiced the chain will almost silently hop onto the intended cog. But today there are few down tube shifters made and very few good ones. So we've dug up some classic new old stock shifters. On the left are genuine Campagnolo Nuovo Record shifters ($39). Next are the superb Suntour Superbe shifters with the ratcheting feature. These, like the Simplex Retro Friction, allow a similar tension when shifting up or down (though Simplex used a different mechanism). These are among the best down tube shifters ever made ($45) . 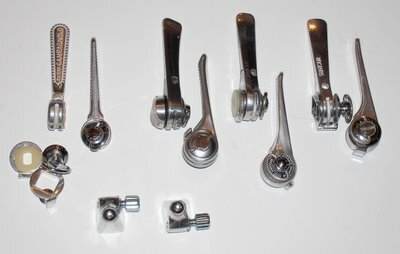 Third are the Suntour LD4850 which also have the "Power Ratchet" mechanism, but weigh a few grams more and are not as shiny ($32). Finally, on the right, are the inexpensive, but very usable Suntour LD4250 ($22). 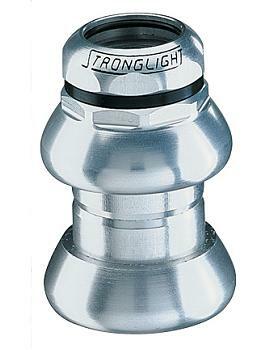 We also will have some Suntour shifter stops for those of you who prefer bar-end shifters or brifters. We'll have them available in the store in a day or two, but like all these old parts, quantities are very limited. Soon I'll post about some classic brand new Simplex, Huret, and Sachs derailleurs we've found. 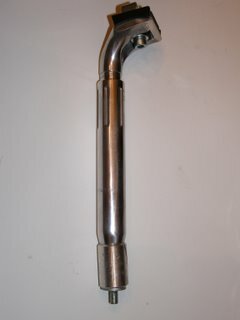 We're also waiting for some cool old ATAX seat posts and a few Stronglight, yes Stronglight, seat posts. It's like 1980 all over again! Finally, due to several requests we now stock the less expensive Quicker X-Treme MTB pump. This is a nice pump for big 650B and 29er tires. 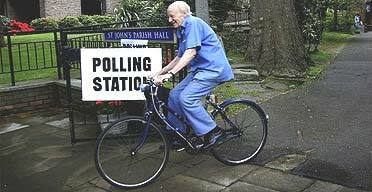 And ride your bike to the polling site. We now have four types of Honjo fenders. On the left are the new 35mm smooth fenders, next is the 35mm hammered fenders. These fenders don't have any indented lines running along their length. The third fender is the 43mm smooth and the one on the right is the 43mm hammered. The 35mm are great for racing bikes and bikes with minimal clearance. The rest of the photos are from the National Arboretum, in Washington DC, where I went for a ride yesterday. It's a beautiful place to do a few laps. 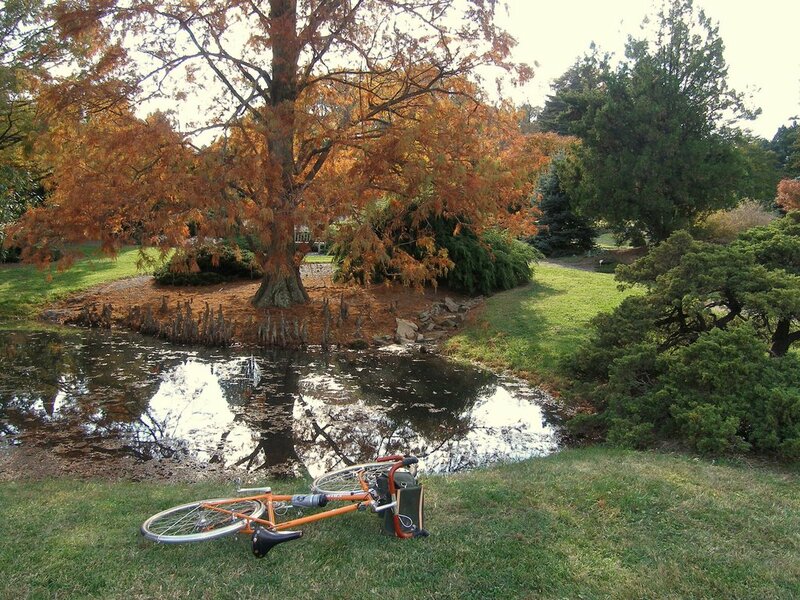 The trouble is you want to keep stopping to look at the amazing foliage and gardens and soon realize you haven't actually ridden very far. 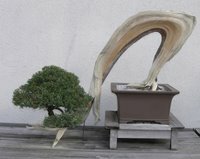 The slow-growing conifer collection is especially lovely and worth a stroll. I also spent some time in the National Bonsai & Penjing Museum which is on the Arboretum grounds. 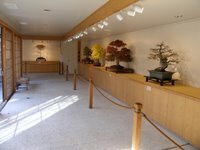 There are more photos here. We get e-mails asking about TA pedals almost every day. Today I learned that TA pedals won't be available again until December. Sorry. I also confirmed that TA will not make any further runs of Pro Vis cranks after this next production run. That last run is in honor of their 60th Anniversary. We have a bunch of the cranks on order, but have already sold out of some sizes. So I've been thinking about trying to increase our order. Does anyone else want to reserve some, assuming I can up our order. The latest is that they are due to arrive in late January. The cost is probably going to be around $225 without chainrings. There is more info here.